Synth guru Ross Kelly investigates the discovery of FM synthesis and development of Yamaha’s legendary DX7 synthesizer in this spotlight series exploring the vintage gear that has had historical influences on music. In 1983 Yamaha made history with the release of one of their most legendary synthesizers, the DX7 Digital Programmable Algorithm Synthesizer. The DX7 was not the first digital synthesizer, but it was the first affordable one to hit the market which ended up sparking a revolution. The unique sound and affordability of the DX7 made it both famous and infamous as the synthesizer sound of the 1980s. 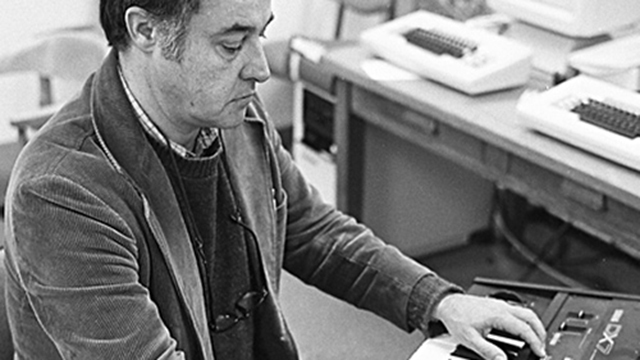 The story of the DX7 began at Stanford University in the late 1960s when a music composition graduate student named John Chowning took an interest in electronic music. He began his research with a piece of early music software called MUSIC that had been developed at Bell Laboratories in the 1950s by a scientist named Max Matthews. Mathews had continued development of this software, keeping it current as technology went from vacuum tube-based computers to transistors. Chowning worked to expand the MUSIC software, and through his experiments discovered the sound creation method that would become known as FM synthesis (frequency modulation synthesis). After some demonstrations of his discoveries, Stanford saw potential in Chowning’s work and pushed to license the technology to music equipment manufacturers. After many failed attempts to find an interested manufacturer, Yamaha sent an engineer to assess the new technology. The engineer was excited by what he saw and Yamaha ended up licensing the technology from Stanford to began further developing the concepts alongside Chowning. The licensing of Chowning’s discovery’s turned out to be one of the second most profitable deals that Stanford had ever inked, bringing in a reported $20 million before its expiration in 1995. Once Yamaha had the license for FM synthesis, it began development of a functional musical instrument. In 1981 Yamaha released the first synthesizer based on Chowning’s research, the behemoth GS-1 FM synthesizer. The GS-1 was built to look like a miniature grand piano that cost close to $20,000 and weighed about 175 lbs. Also, the GS-1 was nothing like other synthesizers of the time. It’s large size, and complex design made it extremely expensive, making it only available to the richest players and the biggest studios. However, it did leave a mark in pop history as the synth used to make Toto’s hit “Africa,” and also served as Yamaha’s test platform for the FM synthesis technology which would eventually bring the DX7 to life. Dr. John Chowning explains the discovery of FM synthesis. By 1983, Yamaha had developed the technology into the affordable, feature-packed DX7. The mono output, six-operator design set the synthesizer world afire. Priced at $2,000 US, it sold over 200,000 units over the first three years. Its design was a departure from previous synthesizers in that it had no knobs, only membrane buttons, a two-line screen, and a data slider for changing its many parameters. Most of the DX7′s controls seemed alien to users accustomed to the standard subtractive synthesizer design that had been around since the release of the Minimoog in the early 70s. Although its functionality was familiar to most users, the sound, however, was something new altogether. Most users at the time never bothered to stray from the presets. A sampling of the 32 original DX7 factory presets. The original DX7 had 32 internal presets and included two memory cartridges with 64 voices each, which made for a robust factory sound set. Yamaha’s inclusion of MIDI was wise, as they beat Roland to market with an MIDI-equipped synthesizer by a year. The MIDI implementation was very basic, but its inclusion was certainly a boon at the time. 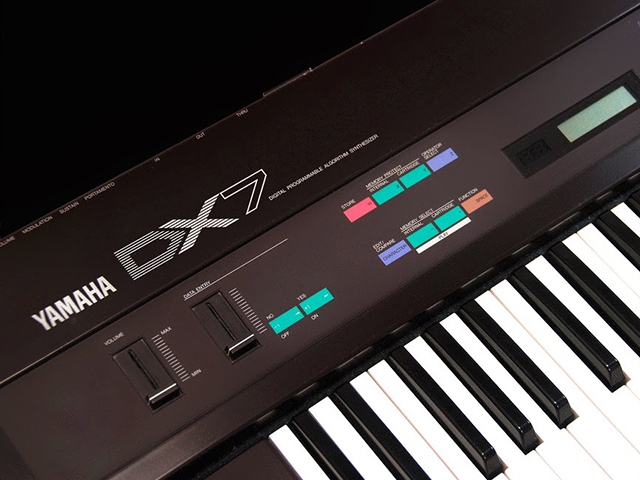 The DX7 took Yamaha from the back of the synthesizer line to the front nearly overnight. It’s release had the other major instrument makers rushing to develop their own affordable digital FM synthesizers. In 1986, Roland would finally release a synthesizer that matched the sales success of the DX7, the Roland D50. 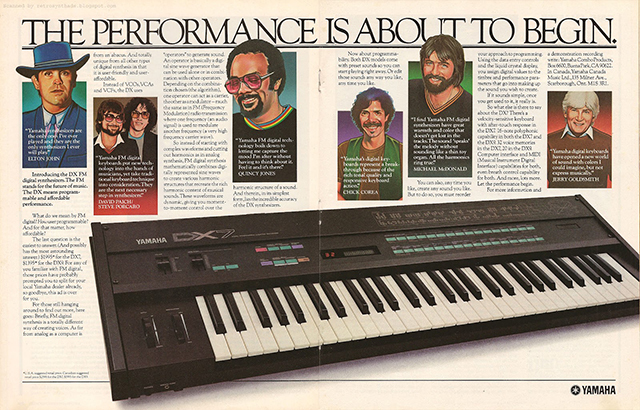 Yamaha took advantage of the DX7′s momentum and followed it with many other units based on FM technology. 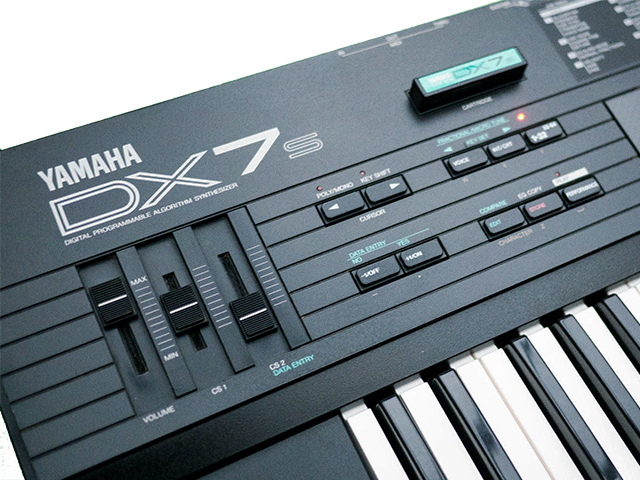 The DX7 itself would see several revisions during its production lifespan from 1983 to 1989. The DX7 IID, released in 1987, updated the original 12-bit digital-to-analog converters to 16 bit, expanded the internal memory from 32mb to 64mb, included bi-timbral for keyboard splits and layering, and redesigned the casing with real buttons instead of membrane buttons. Next came the DX7 IIFD, which added a floppy drive for storage. Finally, the DX7S followed which was essentially the original DX7 in the new case with upgraded digital conversion. Yamaha also began developing an entirely new affordable line of synthesizers based on the DX7 designed as rack and desktop modules more appropriate for studio use. The new DX-based keyboards included the DX21, DX9, and DX11. They also made the TX-7 (a desktop version of the original DX7), the TX81Z (the first FM synth to use waveforms other than sine), and the TX802 (an eight-part multitimbral rack version of the DX7 mkII). The DX7 quickly became the sound of the 80s, immediately recognizable for its bell and percussion sounds, and its famous electric piano simulations. Inexpensive sampling instruments and sample-based synthesizers “ROMplers” would catch fire in the late 90s and cause the DX7 to be forgotten. However, the DX7′s popularity surged again in the 2000s when a new generation of sound designers discovered the power of FM synthesis. Electronic and pop producers found that DX7 sounds could give a modern production a retro touch. In 2001, Yamaha released the DX200, a combination groovebox-style FM synthesizer that included a drum machine with knobs for easier programming. In 2002, Native Instruments released the FM7 plugin, introducing the classic sounds of the DX7 to a new generation of computer-based producers. FM7′s graphic interface made it much easier to program the complex FM architecture. Then in 2006, Native Instruments followed up with its powerful FM8 FM Synthesizer plugin. NI FM8 Tutorial: Creating Unique Basslines Using FM Synthesis. During the late 1980s, the DX7 was heard on many hit records. Artists like Phil Collins and Peter Gabriel had a heavy DX7 sound. Even Michael Jackson used it heavily on his hit song “Bad.” The Beastie Boys song “Girls” from their album License To Ill features drums and the DX7 Marimba as the entire backing track. Sounds from the DX7 was heard across all genres of music, featured on albums by artists like Chick Corea, George Michael, Luther Vandross, Billy Ocean, Depeche Mode, Madonna, Tina Turner, SOS Band, Level 42, Jan Hammer, Walter Faltermeyer, Brian Eno, Kraftwerk, The Talking Heads, U2, Queen, Yes, Toto, Elton John, Herbie Hancock, Jean Michel Jarre, and countless others. The only synth sound in the Beastie Boys 1986 song “Girls” is the DX7 Marimba preset.